In this day and age, content is king. SEO is taking up more and more of the marketing budget, as well it should be. And how do you know if your strategy is working and actually bringing in revenue? 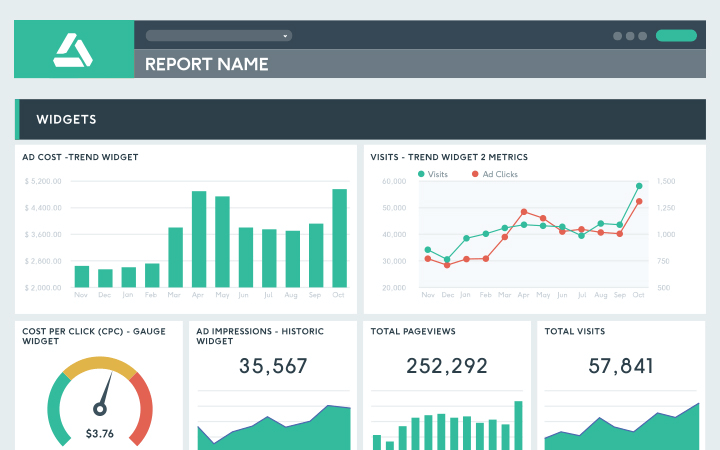 By tracking your data with an effective and simple SEO reporting tool like DashThis! You aren’t only working with one digital platform, right? Maybe you’ve got Moz and WebCEO to find your keywords and rankings, you’ve got Google Analytics to check the web traffic your content is driving, and you’ve got a myriad of other tools to look through for tons of other stuff. Connect everything into one single platform, and stop going from one tab to the next all the time! No one likes to look at a boring page full of numbers. With DashThis, you can make your data suddenly look interesting, and maybe even a little fun! Who knew data could be fun? By adding your logo, customizing your widgets, and picking and choosing exactly the KPIs you want in your SEO report, your data and the story it tells can truly be your own. Whether your SEO reports are for your business internally, or they’re for your client, you need to share them with others! That’s why DashThis’ SEO reporting tool enables you to set up an automatic email dispatch, download a PDF of your report, or even share a secure URL link so that your data can be accessed from anywhere, and at any time! DashThis supports all the major digital marketing tools that you’re already using in your SEO strategy. Google Analytics, Moz, Majestic, WebCEO, and a ton of other ones! And if you’ve got your own custom data, we can handle that too; with our trusty CSV file manager, no data is off limits for our SEO reporting tool! We know… SEO reporting can be time-consuming, and your time is better used to develop amazing strategies, optimize those pages, and maybe create some killer content! That’s why these agencies, among so many others, have chosen our SEO reporting tool to save them their precious time. We developed our SEO reporting tool to ensure that the process is as simple as possible for you, all while ensuring you still have all the features you need. All the benefits of a customizable tool, without the hassle of needing an IT specialist to set it up? That’s DashThis for you! Find a pricing plan that fits your SEO reporting needs and only pay for the number of dashboards you use. Remember: every feature is included with every single plan. And yep, having your very own account manager is also included, no matter what! Let us create you a custom report with a white label design that reflects your brand’s colours, fonts, and overall vibe. Save on a custom URL and design with a white label bundle that includes both! A SEO report just the way you want! Organic visits, Conversion Rate, Sales, Ranking… There are so many KPIs you could be tracking in your SEO report, and picking the right ones for your business can quickly become overwhelming. Fortunately, DashThis has got your back with a SEO report example you can start using right away! Read our blog for more SEO related content! Our blog is a great place to find SEO tips, tricks to creating the perfect marketing report, and everything regarding our product and updates!